I’m in the middle of a major edit of Shadows at the moment and I thought today I’d share a little about how this looks. Earlier in the year I met the amazing Nicola O’Shea (editor extraordinaire of authors including Belinda Alexandra) at a NSW Writers’ Centre event. She read the first 15 pages of Shadows, loved what she read and we agreed it might be fun working together a bit more on my manuscript (MS). So I sent her my full MS and she gave me the most detailed feedback. The down side – at the time I thought I was really close to being finished, almost ready to start querying but, as it turned out not so much! Holy cow was I a long way from being finished. The result – a MAJOR structural edit. I mean completely changing the structure of the book. A LOT of work to come. The up side – I can totally see how this will make Shadows a much better novel. So, the journey so far looks a little like this…. The Pantsing stage. Pansting = flying by the seat of your pants. I tend to start all my writing by pantsing. I usually have an idea, often a picture in my head, and I write without knowing where my characters or the story are going to take me. With The Point I started with a picture in my mind of 2 people sitting on a bench. I didn’t know who they were, what their connection was, what the significance of the bench was. But I started writing and they soon showed me the way. With Shadows I started with what would become one of the final scenes, Alice lying in the grass with Dean (I can’t say more because it’s a pretty significant part of the story and I don’t want to give anything away). I didn’t know how she got there or what would happen after that moment but once I started writing, Alice told me what she wanted. I love this part of the journey – the unknown, the discovery. My Pantsing stage looks like this. Ideas, inspiration, random thoughts. Once I’m 30K words or so in and have a better sense of who my characters are and where they’re going, then I move on to the next stage. The Plotting stage. Plotting = nutting out the details and mapping how you’re going to get from A to B to C. This where I knuckle down and figure out all the minor and major plot points and how they fit together; where I plan how the story is going to move through the beginning, middle and end. My Plotting stage looks like this. Colour coded even! The Editing Stage. This is the Polishing stage. Throwing bits out (that always hurts), adding bits in; checking there is flow and connection between the different elements; finding the holes, plugging them up; rounding out the story; figuring out that you haven’t really finished and going through yet another edit. And in the case of Shadows, completely overhauling the structure. And this is what my editing stage looks like. Yes, the chocolate is an integral part of the process. 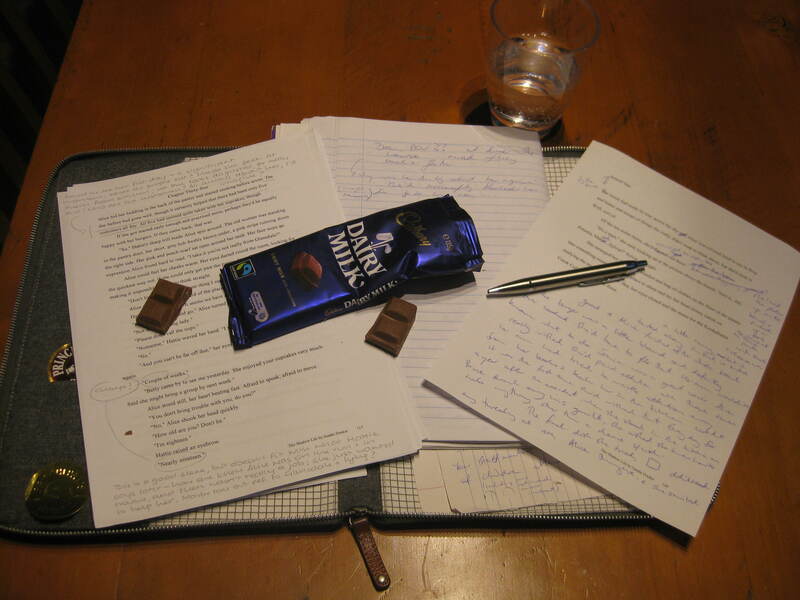 So, I’m in the editing stage (or chocolate stage) right now. I’m not sure how long it will take. Nicola’s suggestions mean a lot of work. But, I’m hoping not too far into the new year, Shadows might be ready to be thrown into the query trenches. I do love all stages of this crazy writing journey, but pantsing is probably my favourite. Writers – what’s your favourite part of writing? Readers – what’s your favourite part of reading a novel? The beginning when you’re discovering something new? The middle when you’re in the meat of the story? Or the end, when you reach the resolution? This entry was posted in WIPs, Writing Journey on December 18, 2014 by sandiedocker. The middle – too often the ending is just plain wrong! PS Readers get to eat chocolate the whole way through the novel! I hate it when an ending lets you down. Secret – we writers eat chocolate all the way through too! Looks like you have a nice process there! Always good to learn what works best for you. Hmmm, my favorite part of writing… Well, I’m a pantser, too, so rough drafts can either be wonderful experiments where I meet a delightful new cast of characters–or holy terrors where I consistently feel like I’m trying to learn how to pull my parachute while hurtling toward the earth. (Usually a combination of both). 😉 I think I’d have to say the editing process is much more to my liking. I’m a perfectionist, and loooove line edits, especially. But isn’t that the fun of Pantsing???? As long as you manage to pull the chute. I enjoy structural editing, but line editing does my head in. And no matter how many times I read something, I always miss a form/from, or an in/on, or a ot/to. Always! 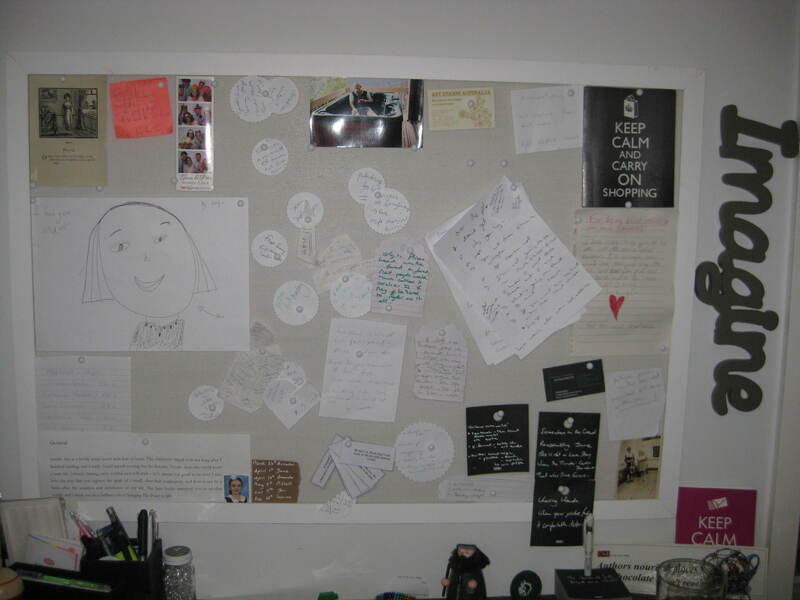 I so need to make better use of my corkboard! Nicola has been amazing. If I can pull it off, we might just have something a bit special on our hands. I love my boards. So much so that that I got 2. If I could figure out a use for a third, I’d get another. Oh, hang it! Let’s just cover all the walls with cork! I love hearing about the writing process of other writers and especially love the pictures you shared of your process. 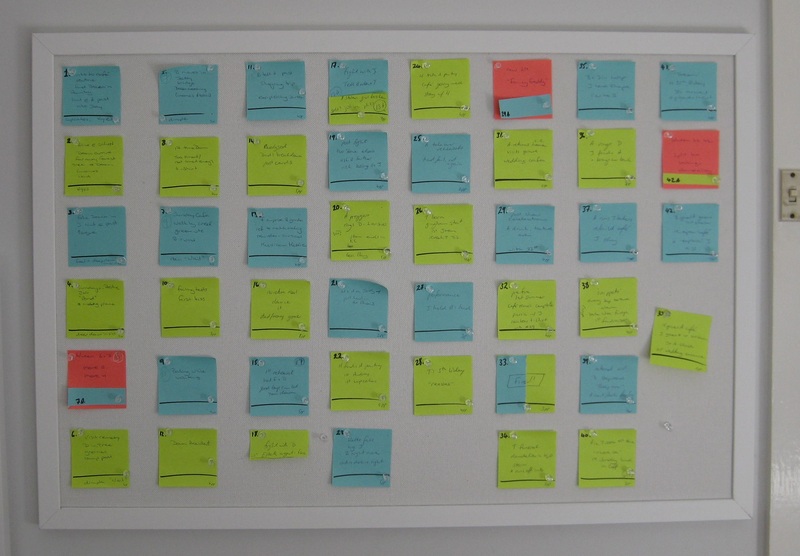 I have a similar plotting board – a large cork board with index cards attached and lots of notes. It helps me stay on track and keep a close eye on the backbone of the story. Best wishes to you during your rewrites and editing. Cheers! Thanks Julie. Can you believe I’ve found an excuse to get ANOTHER cork board. Happy days.